Are you looking for heavy weight technical performance or lightweight high-fashion? A typical Moncler jacket costs anywhere between $1000 and $2000. The most expensive one we've seen? $3,195. Canada Goose's most popular model, the Kensington, retails for $895. At Meurice Garment Care, we’re extremely passionate about quality, and do our best to discern great craftsmanship from merely an expensive brand. It’s one of the issues we face most often in the garment care industry--an extremely expensive garment that was simply not made to last. Therefore, to save you the hassle of being caught with a $1000 regret, we’ve taken the liberty of doing a full test of both Moncler and Canada Goose, and at the end we offer our final recommendation. First, are they even worth it? Considering the quality of either product, we truly believe you get what you pay for. That sounds cliche, but compare it to a North Face jacket which retails for about 400 dollars and lasts half as long--we think the investment is well worth it. While most down jackets are manufactured in Asia out of 100% synthetic materials, both Moncler and Canada Goose jackets are artisan crafted out of very high-quality fabrics and down. Unless you’re the type who prefers to purchase a new jacket every season, we truly believe you get a much better value buying either a Canada Goose, Moncler, or these other high-quality brands: Moose Knuckles, Kanuk, and Nobis. Despite Canada Goose and Moncler's relatively higher price points, luxury retailers like Bloomingdale's and Neiman Marcus repeatedly sell out of stock. Jacket prices range between $1,000-$2,000; beanies alone can retail for at least $465. At this price point, we’re talking about designer branding. At a certain level, cost is no longer associated with functionality, but with brand reputation and fashion heritage. Our best insight is that Moncler should be judged somewhat like a Range Rover--a luxury product with a high price point, combined with rugged functionality and quality manufacturing. 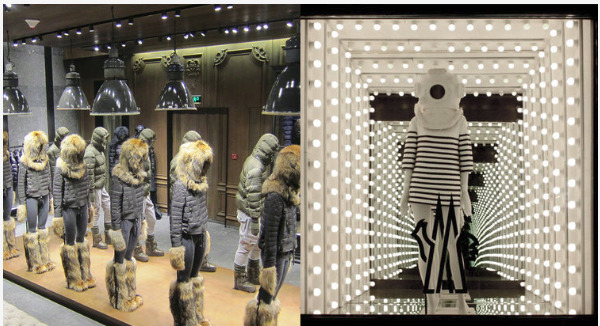 Besides its designer branding, Moncler was, at its heart, originally designed for harsh conditions and expeditions. Jacket prices range from $525 to $1,275. Our favorite jacket from this season’s collection is the Skreslet Parka, which retails for $995 in the US. Co-designed by Laurie Skreslet, the first Canadian to summit Mount Everest, the jacket is reasonably priced for something that both looks fashion forward and can withstand a spontaneous Arctic expedition. This is another testament to 'getting what you pay for.' If you want a jacket that can keep you warm during Himalayan blizzards, we feel that a $995 price tag is justified. A side-by-side fit comparison. There are puffier models of Moncler as well, but in our opinion they look overstuffed and a bit exaggerated. In our opinion, this is the greatest difference between the two brands. Compared to most down jackets, Moncler fits tend to be slimmer, sharper, and more stylized. The brand’s fashion reputation is quite well-deserved, as they are always pushing boundaries and blending designer fashion with high quality warmth technology. Furthermore, Moncler has recently released a wide array of patterns and finishes that allow you to differentiate yourself and stay on top of the current trend of bold statement pieces. If design is a top priority, we’d recommend Moncler over Canada Goose for their inventive and designer aesthetic. Straightforward and utilitarian, Canada Goose offers a no-frills look that is as versatile as the denim jean. Wear it on practically any occasion, and you’ll immediately look bold and ready for the winter season. It's true that many people in New York wear the same or similar looking models, but the look is so simple that we don't necessarily see it as a detriment--sort of like the blue jean. While their down jackets may all look fairly similar, look out for Canada Goose’s Black Label collection (watch carefully, they sell out quickly) or one of their many other collaborations. Despite the criticism for looking somewhat “dull” or “plain,” we feel the refined design is quite timeless and looks great in a variety of colors. Especially with Moncler, there are different ranges of "warmth." We absolutely recommend checking the temperature rating on a jacket before purchasing, as they will give you an accurate range in which you can expect to stay protected. Fill rating and weatherproof rating are also important to consider. It's true--when you try on either Moncler or Canada Goose winter coat for the first time, you immediately feel the difference. The weight of each jacket is made to feel snug and perfectly balanced against your body, keeping your body temperature closely sealed inside. Both are constructed with 90/10 down-to-feather ratios, which is the best on the market, are on stuffed with high-quality down feathers that are both light and insulated. When selecting a jacket weight, remember: the higher the fill power, the warmer the jacket will be. A higher fill also means the down is stuffed with high quality feathers. Moncler boasts top-of-the-line Italian construction and a 90/10 down-to-feather ratio. According to Moncler, “this means wind cannot go through the coat, and the coat is much lighter than other companies', but is a lot warmer too.” This is a distinct feature in Moncler jackets--the light, comfortable weight that maintains an unexpected amount of warmth. When you try on a Canada Goose, you get the sensation that you’re permanently protected from the cold, as if you’re walking around in a warm shelter. Pull over the hood and zip up the fur liner, and you pretty much are. The protection against the wind is exceptional and even the length of the zipper is protected, which creates a nearly impenetrable block that keeps cold completely away from the inside of your parka. Remember, you're paying for warmth and protection as you are style. Both Canada Goose and Moncler were originally designed for extreme weather conditions. Canada Goose was worn by rangers and Arctic miners, while Moncler was worn by French skiers and mountaineers. Both Canada Goose and Moncler are built from the highest quality materials, which lends to their popularity and trust by so many consumers. Like the warmth factor, you will immediately notice upon trying on either jacket, the superior difference in material quality. Not only are the fabrics durable, they are soft against the skin. However, there are major differences in the construction of the two jackets, namely, the weight of each jacket’s exterior fabric. Moncler jackets are built using Japanese nylon, which is very fine so the chances of a loose feather is extremely small. The down ratio is 90 percent down, 10 percent feather, which is the best on the market. The Men's Snow Mantra Parka is constructed from 247 separate pieces and requires 87 different craftsmen. Brand Stigma: The biggest criticism of Canada Goose has been its “unethical” sourcing of coyote fur for its fur-lined hoods. Although Canada Goose argues that its use of coyote fur is actually a by-product of population control and indeed ethically sourced, animal rights activists have vocalized their distaste for the brand and placed what some might call a “stigma” on the brand. However, CG has responded quickly and is starting to move away from the fur-lined hoods, opting for a more modern, sleek look. Comparatively less style: One can argue that Canada Goose looks a bit less stylized than a designer brand like Moncler, however, that utilitarian look is part of CG’s core identity. In addition, their designer collaborations (if you can score one) are much more creative, albeit expensive, and offer the same warmth and durability the brand is so famous for. Pervasiveness of brand: As proponents of individual style, this is perhaps our biggest qualm with the brand--the issue of being too popular. In New York, Canada Goose patches are seen on maybe two out of every five people walking on the street. What does this mean? Perhaps you’ll have to sacrifice having the same jacket as a few other people, if it means being completely unfazed by the ice cold winds of NYC. Designer Cost: Whether this is a weakness is debatable. Moncler has positioned itself as a truly luxury brand--one that may even consider form over function. If you’re looking for a winter coat that will protect you during the harshest colds of January and February, perhaps this isn’t the choice. However, if you’re willing to bear a little cold in order to look top-notch, Moncler’s style is hard to compete with. Difficult to Wash and Clean: There have been many claims on the internet about the shiny finish coming off Moncler jackets after washing. This may have been an issue on the consumer end, however, Moncler may have taken note and somewhat moved away from their signature shiny finishes. No Lifetime Warranty: Again, this goes back to the debate of form vs. functionality. Canada Goose offers a full lifetime warranty on all their jackets, meaning your investment in the brand is guaranteed to last for many years. Moncler coats, in contrast, should be worn more gently and not in extreme conditions. The jackets are very warm--undoubtedly--but long-term durability is a factor with any designer investment. So, which do we recommend? If your primary concern is warmth and durability during the freezing cold winters of New York City, then we absolutely recommend going with Canada Goose. For about half the price, you get one of the warmest coats in the world, and a lifetime warranty on top of that. We recommend going for the full-length models, which drop below the thigh. Zipping up your coyote-fur lined hood, we promise you’ll be absolutely good to go while you wait on desperately long lines in sub-freezing temperatures. Despite Moncler’s origins as an expedition-tested brand, we found that Canada Goose is more weatherproof, durable, and heavy (in a good way) than its more expensive counterpart. If you prefer form over function, the Moncler brand offers some of the most beautifully styled jackets in the world, with marginal loss in terms of warmth. Some may argue that the sharp, slim fits combined with eye-catching patterns and finishes easily make up for Moncler’s slightly less rugged construction. If you are a seasoned designer wearer, conscious of how to wear expensive garments, you won't have a problem with Moncler's more delicate finish. However, we definitely would not recommend skiing with your Moncler jacket, as getting it cleaned or restored is no small feat. As beautiful as your designer jacket may look, you won’t want to wear it during rain or inclement weather. Meurice Garment Care is a family-owned garment care specialist. We've been cleaning and restoring designer attire for over 50 years and we're passionate about quality craftsmanship and enjoy sharing our knowledge with our readers. Meurice is in no way endorsed by any of the brands mentioned in this article.